Sometimes life gets so crazy that you need to find simple solutions to home decor ideas. 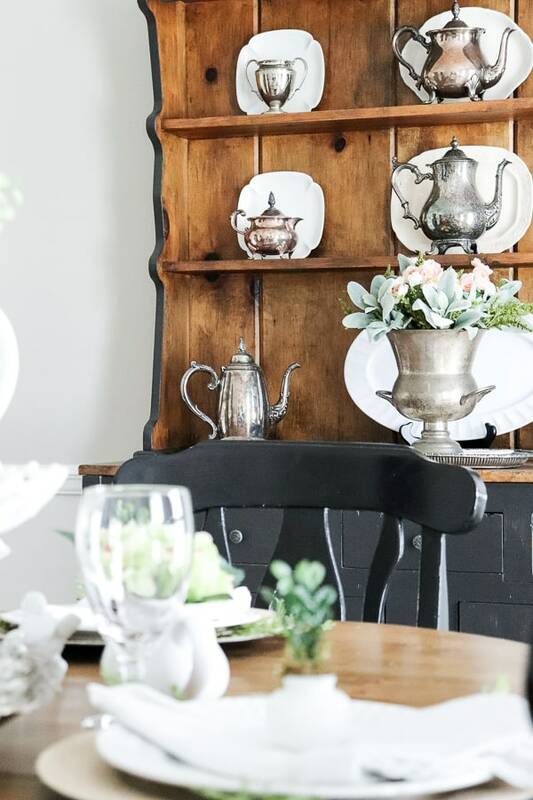 So I shopped my home and added some faux florals for this Easy Spring Tablescape. Spring is nearly here and that means the changing of the seasons is on our minds. 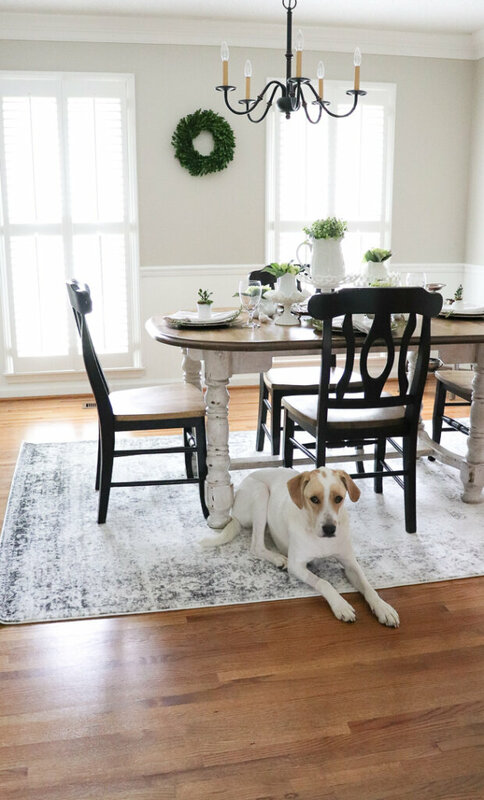 I have teamed up with a group of bloggers to bring you Spring inspiration from their homes – easy DIYs that you can try and pin for later. If you’re coming here from A Blue Nest, welcome to my home! I’m so glad you are here and hope you have fun looking around. Jordan’s faux potted flowers were so lovely, weren’t they? Well, I needed a simple way to add some Spring to my home. We are currently Limewashing our home, about to plan a kitchen remodel, and just finished our taxes. I’m overworked and exhausted. But does that stop me from wanting to usher in Spring with some decor? The kelly green leaves, the pastels, the lighter hues – I want it all, but found myself without the time to do it! 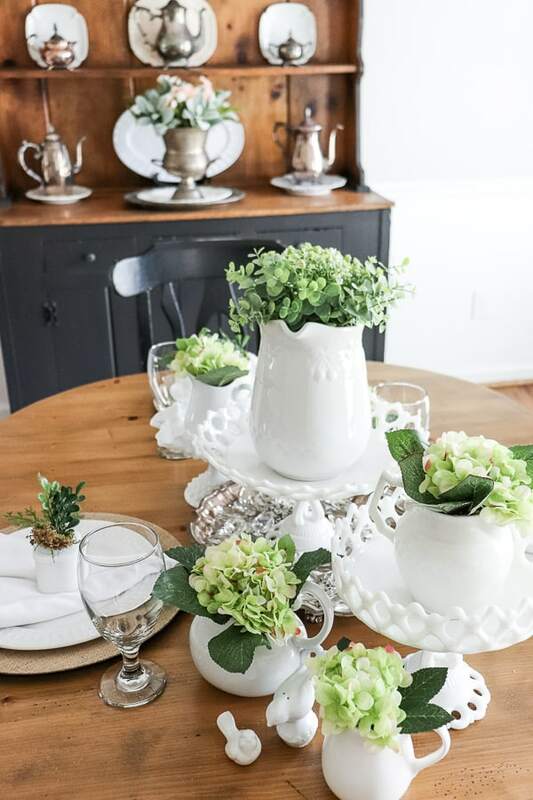 So I came up with an Easy Spring Tablescape using faux florals and items I gathered from my home. 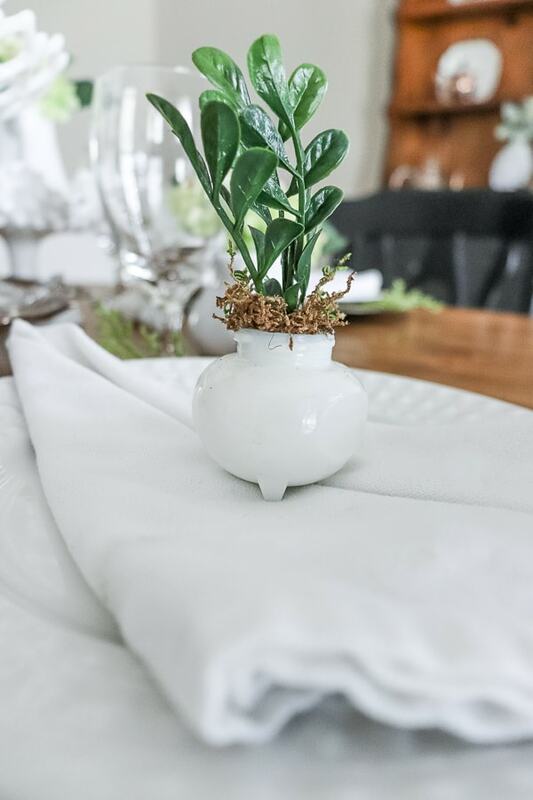 I started my tablescape by gathering some of my favorite milkglass pieces. 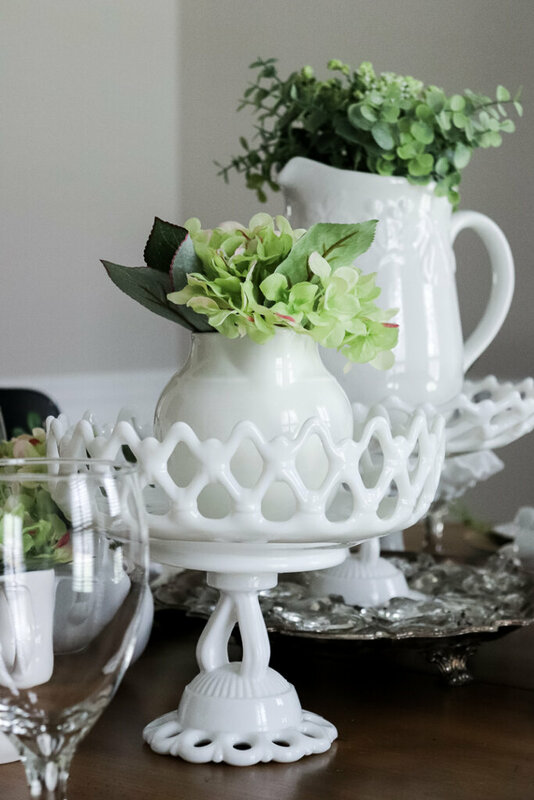 I don’t know what it is about milkglass – but it just seems like the perfect item for Spring decor. 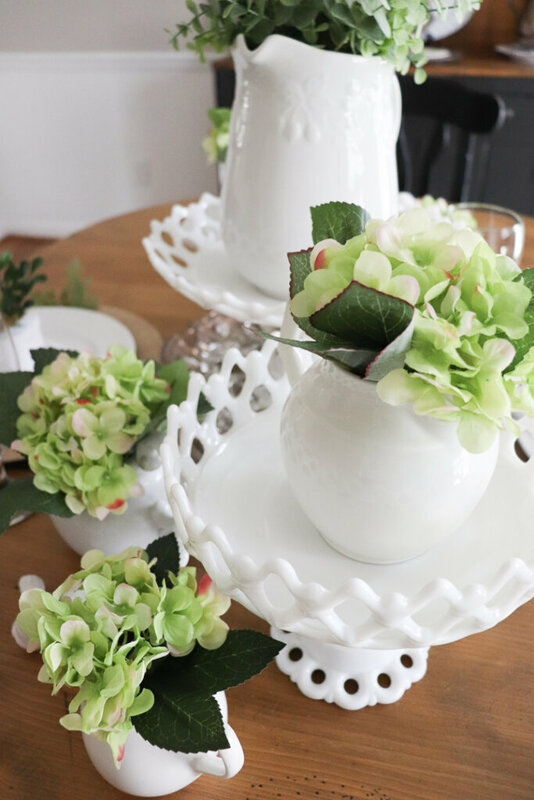 Varying heights with cake stands and small pitchers created a fun, multi-leveled centerpiece. These faux hydrangeas from Afloral are so realistic! I love the green hues with those light pink tips! They came in one bunch, but I separated each bloom and filled each small pitchers with one. Those kelly greens are getting me! So pretty against that milk glass! I added some rananculas to my tarnish silver ice bucket on my newly painted hutch. 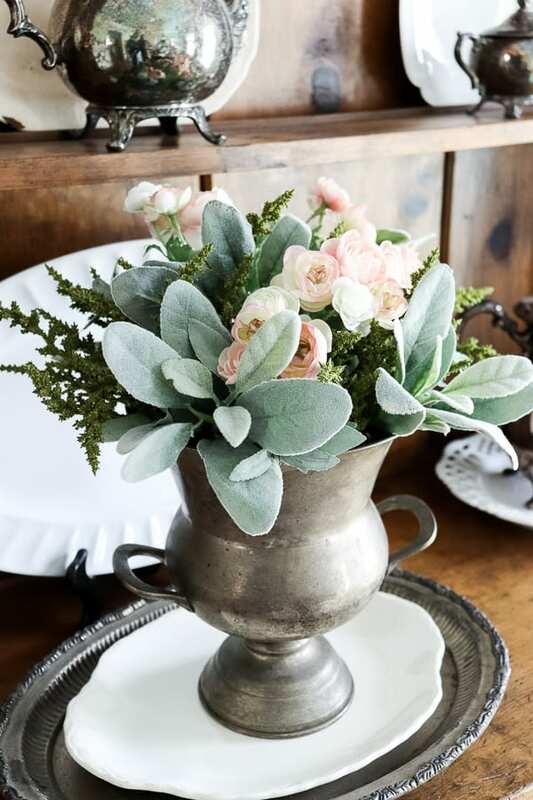 I already had the ice bucket filled with the lambs ear and evergreen sprigs, but I loved how that addition of flowers added a feminine touch. For my table setting, I found some gorgeous plates at a thrift store, made by Elle Decor. The plate pattern is called Amelie and I just adore them! 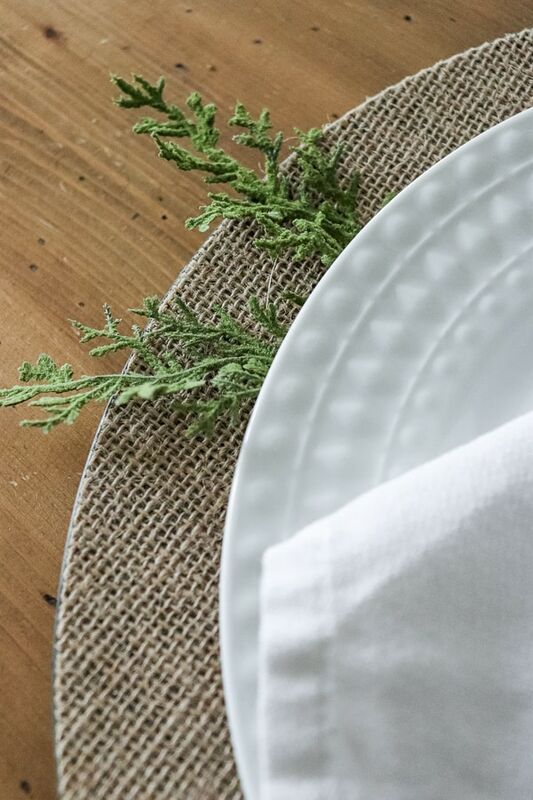 After I placed them on some Burlap Chargers I had on hand, I added sprigs of bright greenery. 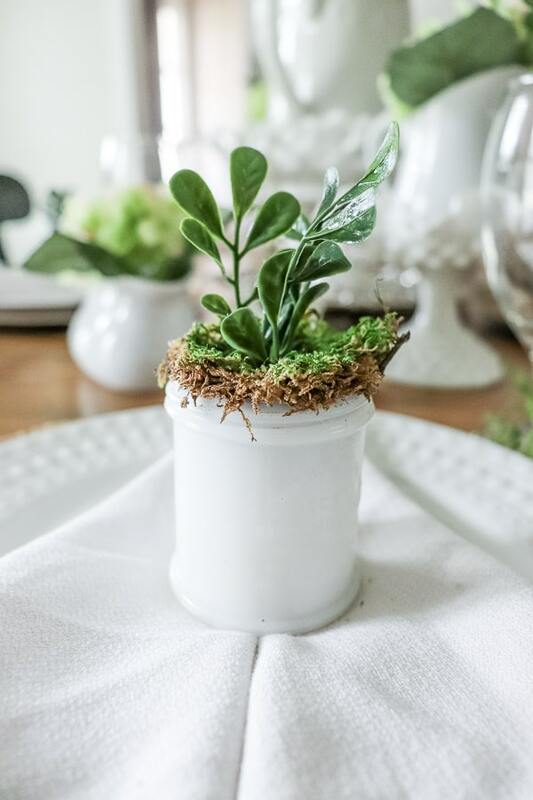 So I gathered four of my vintage milk glass mini jars and added some moss and a sprig of faux boxwood. And I love the realistic look of these boxwoods. I have the faux boxwoods in a planter next to the table and I love the varying heights of each stem! And check out that painting, friends! That is a custom creation from my Father-in-Law – isn’t it lovely? I added a dried boxwood wreath between the windows for another hint of greenery in this room. I also found this rug on Amazon for a steal! 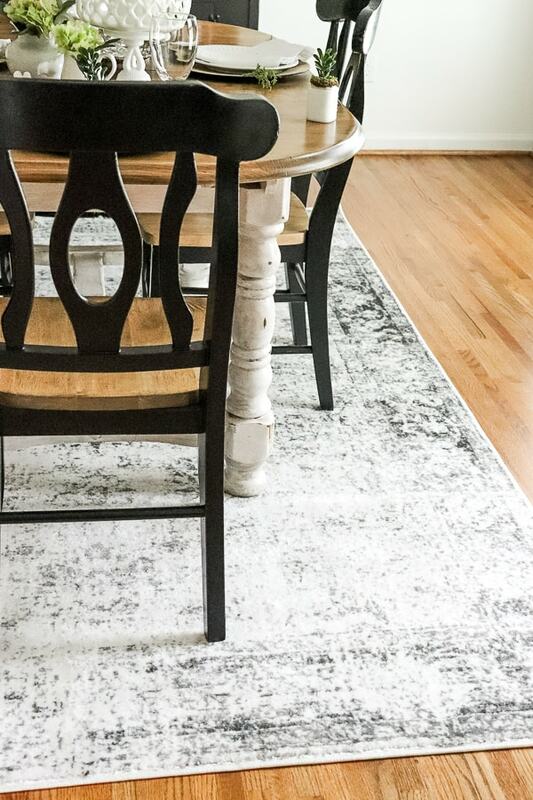 The rug is a 6 x 9 made by Unique Loom. It paired nicely with my Charcoal hutch and it was so affordable! 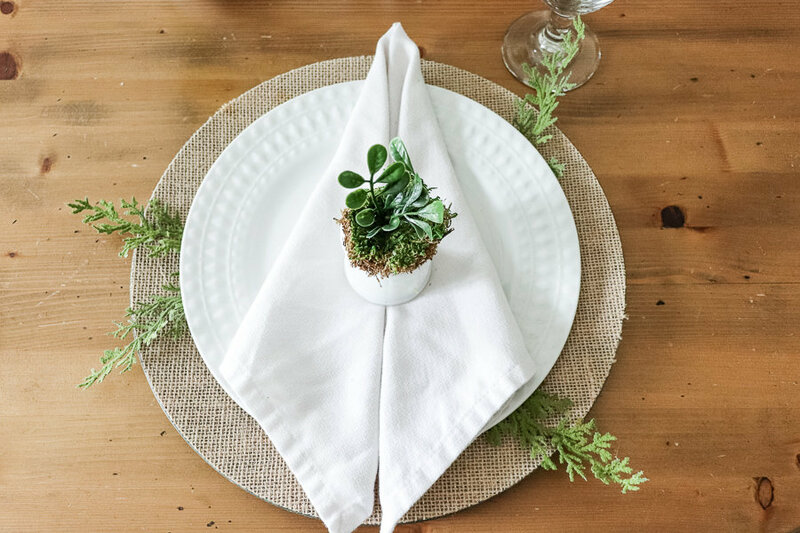 So this Easy Spring Tablescape made from items around my home and faux florals is a perfect – and quick – way to add decor for the season. 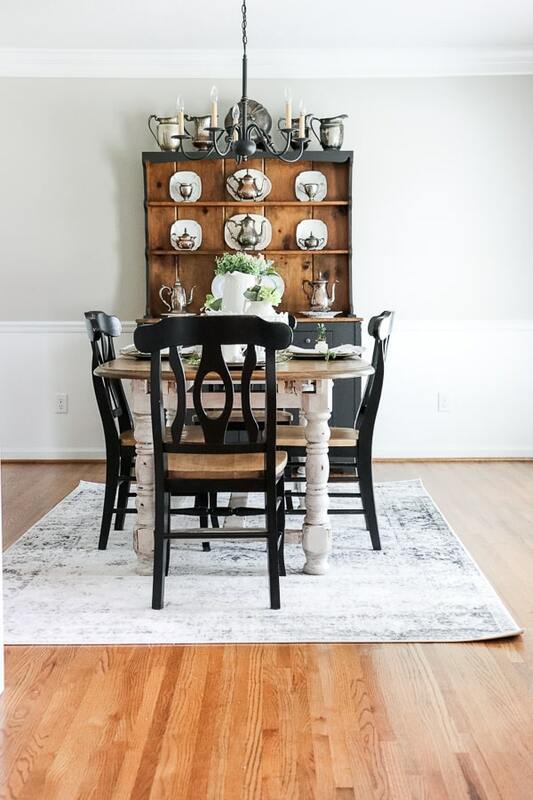 Now it’s time for another inspiring blogger – hop over to my sweet friend Lindsey’s blog, Repurpose and Upcycle. She is sharing all the details about air plants and how to incorporate them into your decor this Spring! 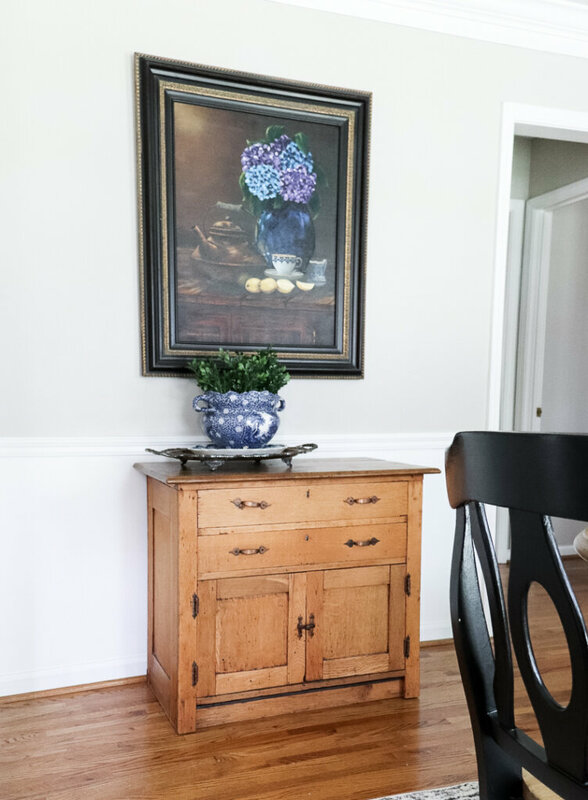 Of course be sure to check back each day this week, when another group of bloggers shares corners of their homes! You can see all the bloggers who are joining up below – and lemme tell ya! There are so many beautiful homes to see! Everything looks to fresh and pretty, Jen! I’m all about using green this spring too. 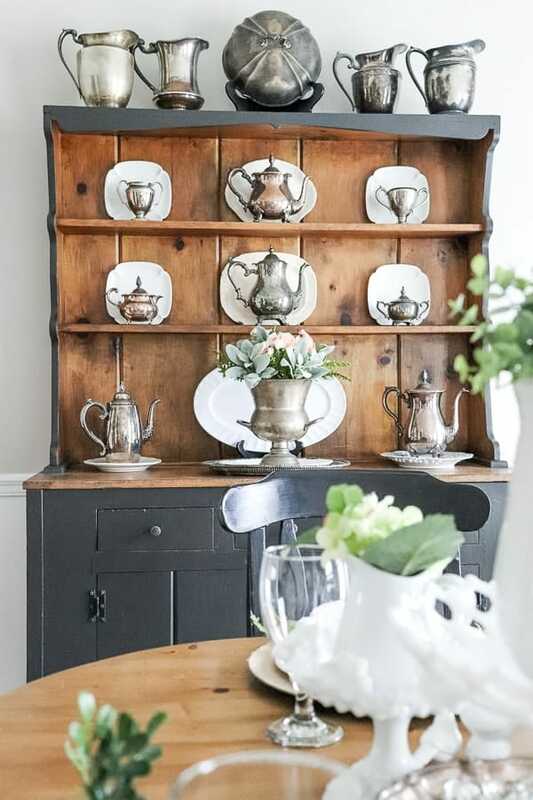 I’m so envious of your wonderful milk glass collection – it’s awesome! Thank you so much Suzy! I’m such a sucker for milk glass! I not only love how pretty it is, but it’s always so affordable! I can’t wait to see what the rest of the week holds – oodles of inspiration! I just love all your faux flowers! The soft greens look great against all the white china. 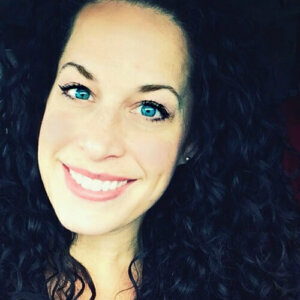 I’m so glad to be joining you on this blog hop! So gorgeous, Jen!! 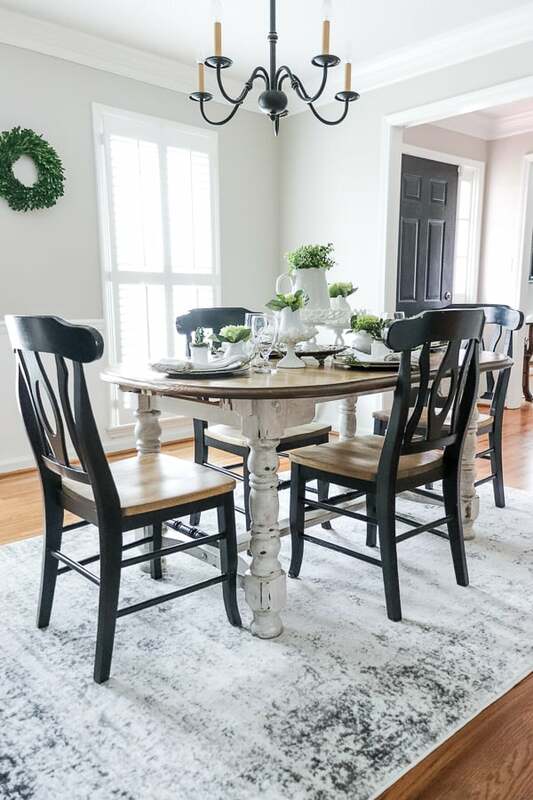 I love how you shopped your home and were able to create such a beautiful Spring dining room! Jen, this setting is absolutely beautiful! 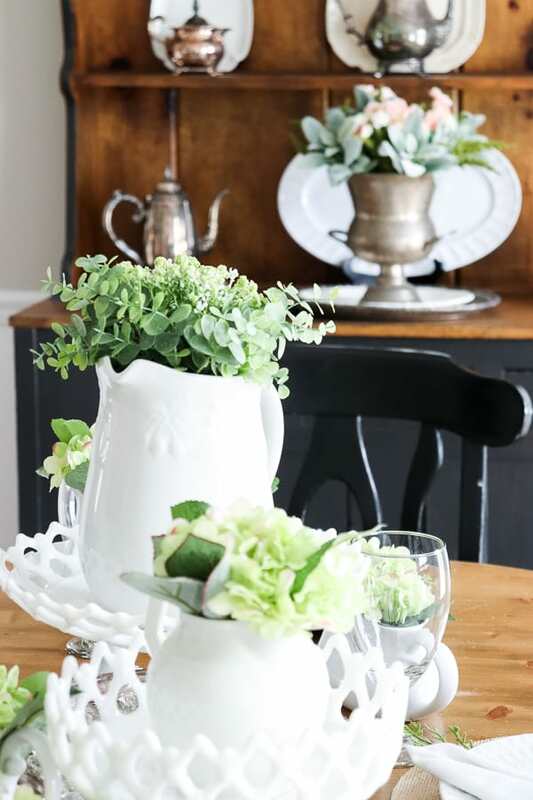 I love the pops of green and your milk glass and tarnished silver pieces are gorgeous! And your father in law’s painting is such a keepsake!! Thanks for hosting this Jen; so appreciate you! Thank you so much Kendra! I am a sucker for milk glass and tarnished silver! I’m so glad you can join us! I always enjoy seeing what you create! Thank you Jordan! I am so glad you are joining us this week!! Thank you so much Lindsey! I am so happy you are joining us this week, too! I love black, white & green. . .such Timeless Classic color choices! The painting, chest and vignette stole my heart! Tomorrow is the first day of Spring and this tablescape is so~o`o inspiring! Jen, Your tablescape is lovely for spring. I love all the green! Even though I’ve heard birds chirping, it’s still so cold here in Michigan and green just reminds me of the leaves on trees and the green grass, yet to come. Jen this is just gorgeous! I love the simplicity and your beautiful flowers! What a great hop full of so much inspiration. Thank you so much for having me! You always set such pretty tables, Jen!! So glad to have teamed up again for another hop! Pat – your kind words were just what I needed this morning! Thank you so much and thanks for taking the time to comment! 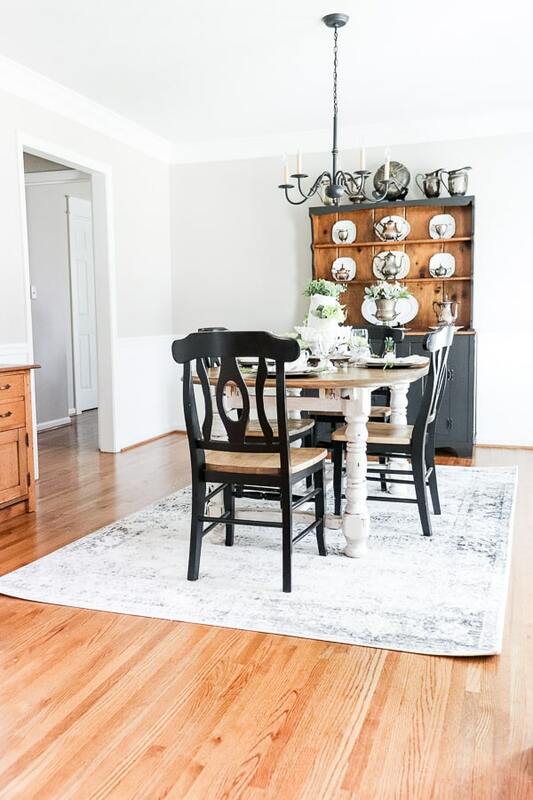 You spring dining room is so pretty, Jen! Thank you for hosting this blog hop! 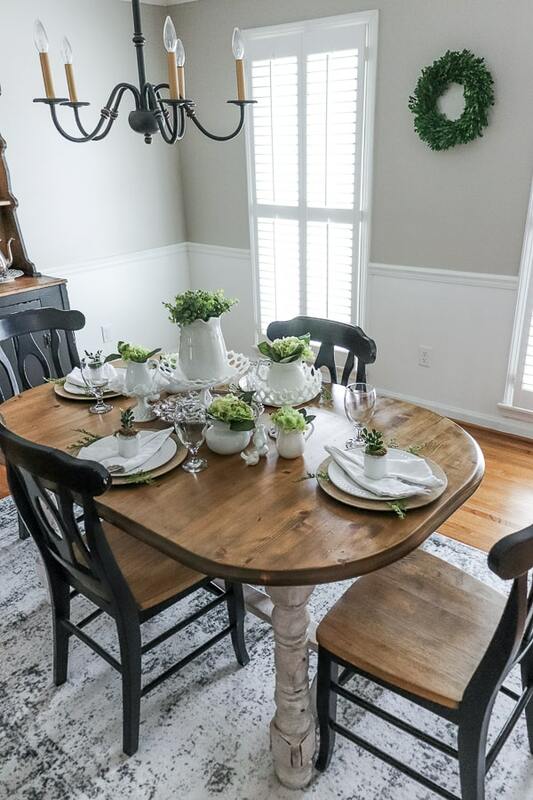 All the greenery is so pretty paired with your beautiful dark furniture Jen. 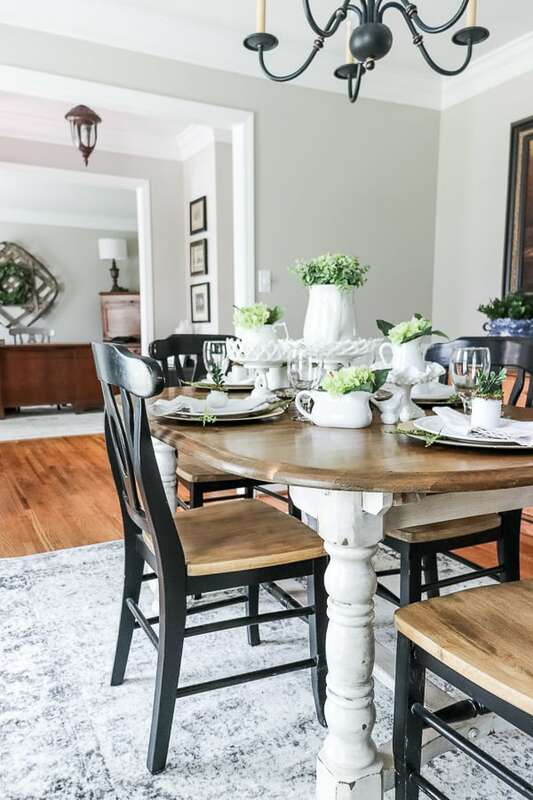 You’re so right, its the best way to add a little spring to your home. I love it all!! Thank you so much Taylor! I am so honored that you joined us for I DIYed that again! Thanks Roxanne! 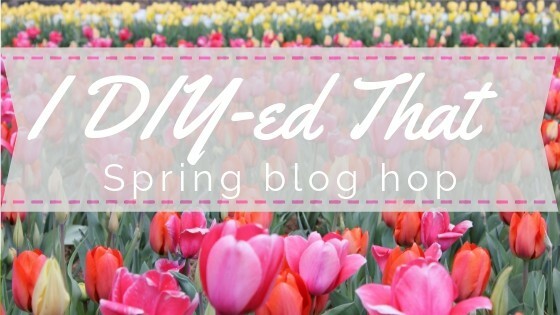 I’m so glad you were a part of this week’s Spring Inspiration! Thank you Kelly! 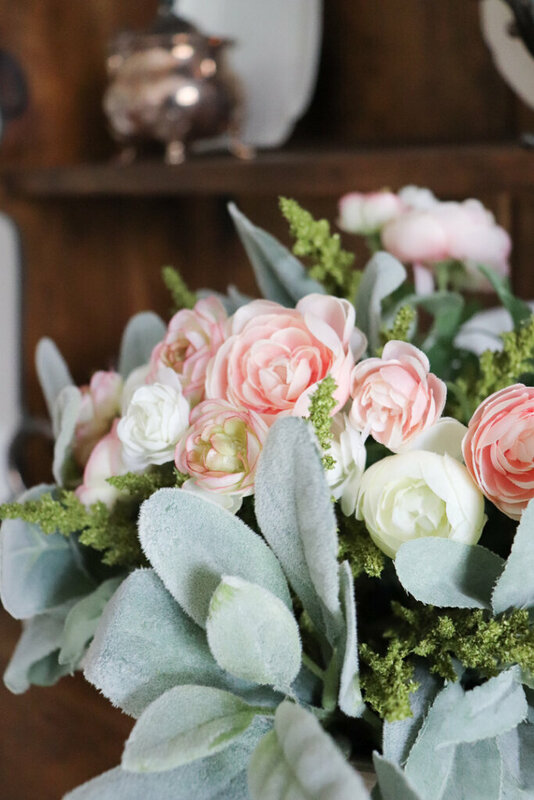 I love real flowers, but always have issues keeping them looking fresh, so I love these faux florals! I’m glad you were a a part of this week’s hop, my friend! Hope that some warmth comes your way soon, Carol! Thank you Bree! Hope you have a blessed week, my friend!